A beautiful combination of stunning white lilies and gerberas. 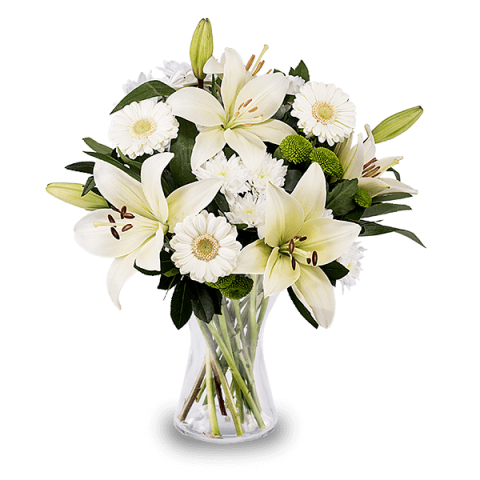 Send this bouquet of white flowers to share a birthday surprise or to welcome a new baby with FloraQueen’s international delivery service today. Perhaps you already have your normal birthday celebrations spent with your friend on their big da, why not do something a little different this year and send them a bouquet of fresh flowers from FloraQueen to add to their special day. Surprise them with a gorgeous bouquet delivered right to their doo, start the celebrations on style this year. With FloraQueen’s selection of flowers and modern delivery system you are sure to bring big smiles to their face for this year’s birthday! Show your friends how important they are to you and how much you care with one of our hand crafted bouquets. The vibrant colors and sweet scents will remind them of you and your sweet gesture as they celebrate another joyful year of life with you by their side as their friend. A sweet bouquet of flowers is the best gift idea for a friend’s birthday. You can easily add a gift card or chocolates to the present as well to give it a little extra something. Make this birthday one that they will remember for years and years to come, the year their dear friend gave them the perfect gift of fresh flowers delivered right to their door on their special day. A birthday is such a special occasion and there are so many flowers how can you be sure that you will select the right ones for your friend’s birthday? For a friend’s birthday a mixed bouquet is always a great choice, the combination of flowers and colors brings vibrancy an excitement to the bouquet representing the joy and love you have together as friends. If you want a more fragrant bouquet select one with lilies, when they blossom they release a rich sweet fragrance that will surely remind your friend of your great friendship every time they smell it. With FloraQueen’s extensive online catalog of flowers and bouquets you are sue to find just the right one that will speak to your friend on their birthday. Combined with our modern international delivery service you can rest assured that they will receive your sweet birthday present on their big day. So that even if you are far away as at many times we are you can still be there with them for their important day. Celebrating another year of life together as friends. Trust FloraQueen as your international floral delivery service for birthday flowers for friends.